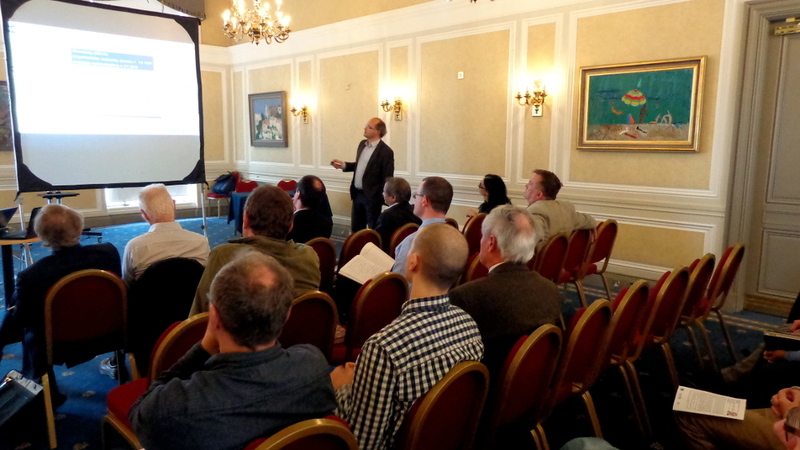 As an early contribution to European Sustainable Energy Week, EuChemS, the Royal Society of Chemistry and the Royal Society of Edinburgh jointly organised a conference on Zero Carbon Energy – The Future at the Royal Society of Edinburgh on 27th May 2015, following a Royal Society of Edinburgh meeting on Climate Change. About 50 people were addressed by world experts in the field. After the opening words of David Cole-Hamilton, EuChemS President, the scene was set by Mercedes Maroto-Valer, Herot Watt University, Edinburgh, one of the organisers of the meeting, who introduced the Energy Trilemma. Resources of fossil fuels are running out, their use is causing global warming and climate change and many places that have reserves of fossil fuels are politically delicate, leading to worries about the security of supply. Having highlighted the problem she went on to discuss methods for reutilising CO2 in fuel manufacture. Md. K. Nazeeruddin (EPFL, Switzerland) then spoke about dye-sensitised solar cells (DSSCs) of which he is one of the inventors, along with Michael Grätzel, who coincidentally was also talking in Edinburgh that day! Nazeer explained the unique selling point of these solar cells, which is their transparency, allowing them to be used as windows with variable colours. These cells have been commercialised and efforts are now being made to improve their efficiency by developing new dyes which will absorb into the near infra-red region of the electromagnetic spectrum. This enhances the theoretical efficiency and in practice can lead to cells which convert sunlight with 15 % efficiency. Hydrogen is a possible solution to all our energy needs since it burns producing only water without greenhouse gases. It can be used in clean fuel cells and is also required for the chemical conversion of CO2 to fuels. Traditionally hydrogen is made from fossil fuels with all the carbon being thrown away as CO2. More recently it has been made by using excess energy from solar photovoltaics for water electrolysis, but this process is very inefficient. James Durrant (Imperial College, London) talked about systems which allow sunlight to decompose water directly into hydrogen and oxygen. Some of these have been known for a long time, but they tend to be of low efficiency and short lifetime. Recent research has shown that efficiencies as high as 7 % are possible and 10 % would allow all the world’s energy needs to be met by the amount of sunlight falling on an area the size of Libya. The lifetime is still short because the processes involved in the formation of oxygen corrode the electrodes. James talked about understanding the process (intriguingly only three of the four electrons required are introduced before the rate determining step) and how the understanding obtained allows the rational design of new, more stable electrodes. Of course, hydrogen is a gas so it is usually stored in very heavy pressurised containers, making its use, especially in vehicles problematic. However, Peter Wasserscheid (Erlangen) talked about a new process for storing hydrogen by reaction with aromatic hydrocarbons that are already used commercially as heat transfer fluids. Both the aromatic hydrocarbons and their hydrogenated products, which contain 6 % hydrogen, are liquids so can easily be transported in current gasoline handling equipment. This means that they can be charged where the hydrogen is generated or at a hydrogen storage facility, easily transported, and then hydrogen can be released at the point of use. They have great potential for use in mobile applications such as trucks and cars. Every lecture was followed by a lively discussion and after the lectures there was a reception where the speakers had the opportunity to mingle with the audience over some food and drink. EuChemS would like to thank Bristow Muldoon and the Royal Society of Edinburgh, and Mindy Dulai and the Royal Society of Chemistry.